When the game of baseball was first played, sticks were used to hit the ball. By the time the game had been officially organized as a team sport, the players either whittled their own bats or bought them from a wood turner. League specifications set in 1863 were broad: any type of wood was permissible and the bats had to be round, not more than 2.5 inches (6.5 cm) in the thickest part. There were no length restrictions. Early bats ranged in weight from 48-50 ounces (1361-1417 g) with an average handle circumference of 4.5 inches (11.4 cm). The hefty weight meant home runs were rare. By the 1960s, however, players such as Hank Aaron were using shorter, lighter bats to smash balls into the centerfield seats. Aaron's bat measured 35 inches (89 cm) long and 33 ounces (979 g) in weight. Modern baseball rules limit bat lengths to 42 inches (107 cm) and the diameter to 2.75 inches (7 cm). There are no weight restrictions. The bats must be made of wood with no metal, cork, or other type of reinforcement inserted into the bat's center. Over the years, several major league players have tried to use a reinforced bat. A particularly colorful controversy surrounded a bat used by Albert Belle of the Cleveland Indians. Belle's bat was confiscated during a game between the Indians and the Chicago White Sox in July of 1994. The bat was stored in the umpires' locker room at Comiskey Park until it could be tested the next day. How-ever, it disappeared overnight. It was returned anonymously the next day and found to have a corked center. In spite of protests, Belle received a temporary suspension. The mystery of the bat's disappearance and reappearance has yet to be revealed. Baseball players are notoriously particular about their bats, and have been so through-out the sport's history. Frank Frisch, who played in 50 World Series games for the New York Giants and the St. Louis Cardinals, cured his bats during the off-season by hanging them like sausages in a barn. Boston Red Sox slugger Ted Williams bathed his bats in alcohol to keep them cool during his many hitting streaks. Williams was also known to visit lumberyards looking for pieces of wood with narrow growth rings. The legendary Babe Ruth preferred his bats to have pin knots in the barrels. Traditionally, forty- to fifty-year-old ash trees are used to make baseball bats because of their strength, flexibility, and light weight. Traditionally, ash trees from Pennsylvania and upstate New York are used to make baseball bats. The ash is valued for its strength, flexibility, and light weight. The best trees are those that grow in dense clusters where they are protected from the wind and forced to grow straight up towards the sunlight. Forty to fifty years of growth is required to bring an ash tree to the preferred trunk diameter of 14-16 inches (36-41 cm). Each tree yields approximately 60 bats. When a tree has reached the proper height and width, a forester marks it with spray paint. A log cutter then uses a chain saw to bring down the tree. The top branches are removed and left in the forest. The tree trunks are sawed into 10-16-foot (3-5 m) lengths, loaded on a truck, and taken to the mill. At the mill, the logs are inspected for knots and uneven grains. Only half of what is cut in the forest is ultimately used to manufacture baseball bats. The logs that make the grade are rolled to a hydraulic wedge that cuts them into 40-inch (101 cm) splits. 1 A mill worker places each split onto an automatic lathe that shaves the rough edges off as it turns the wood. The billets, as they are now called, are inspected again for straightness of grain. The billets are stacked and strapped together into six-sided bundles. Workers paint the ends with a protective preservative to keep the wood from fraying or rotting. The bundled billets are then trucked to the lumberyard of the bat manufacturer. 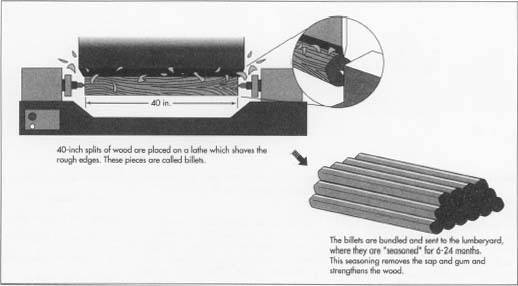 2 The billets that arrive at the lumberyard are considered "green" wood because they still contain sap and gum. In order to strengthen the wood, the sap and gum must be removed by an air-drying process called "seasoning." To achieve the proper seasoning, the billets are simply stacked in the yard for a period of six months to two years. The plant workers who create the final product are called bat turners. They are highly skilled artisans who have been specially trained for the intricate work. When an order is placed, the bat turner selects a billet from the storage bin and creates a replica of the desired model. 3 When the billets have dried completely, they are weighed and inspected for quality. A worker places each billet on an automatic lathe and shapes it into a rough baseball bat shape with a narrowed neck. The bat forms are sanded, inspected once more, and then sorted according to weight. 4 The bat manufacturer keeps a model of each bat made, typically identified by the baseball player who initially ordered it. When a player or team places an order, the order may look like this: six Johnny Bench models, ten Hank Aarons, four Mickey Mantles. The bat turner revolves the billet slowly on the lathe, sanding and shaving it to an exact replica of the model. Using calipers, the bat turner measures the billet every 1-2 inches (2.54-5 cm) and weighs it repeatedly until it is perfect. 5 The bat is branded with the company trademark and the signature of the player associated with the model. The trademark is placed one-quarter of a turn from the sweet spot (the ideal spot where the ball should strike the bat). If the order calls for staining, the bat is dipped into a staining vat. All of the bats are then varnished, packed into cartons, and shipped to the player or team. 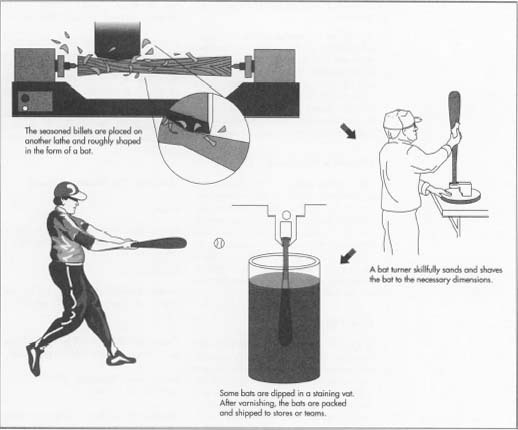 The structural integrity of the baseball bats are monitored through repetitive impact testing. Some factories have compressed-air cannons that shoot baseballs at precise points on the bat. High-speed cameras record the impact while accelerometers measure the velocity. In other plants, robotic arms whack the balls off over-sized golf tees. Inspectors collect data on the frequency of bending and how the balls travel off the bat. In spite of manufacturers' assurances that the supply of ash trees is not decreasing, the development of composite and aluminum bats continues. The wood composite bat typically consists of a plastic foam core surrounded by woven layers of resin-impregnated synthetic fibers. One of the newest innovations is a bat made of "lanxide," a ceramic-enforced material. Proponents of non-wood bats point to their resistance to breakage. These bats also greatly alter hitting power: a player's batting average increases markedly with an aluminum bat. Although the composite and aluminum bats are popular with amateur and college base-ball players, they are required to use all-wood bats if they advance to the major leagues. It is doubtful that Major League Baseball will ever allow anything but pure wood for bats. The sport is steeped in tradition, and the use of aluminum or composite materials would alter the record books dramatically. Arnow, Jan. Louisville Slugger: The Making of a Baseball Bat. Pantheon Books, 1984. Ashley, Steven. "High Tech Up at Bat." Popular Science, May 1992, pp. 108-11, 122-24. Curreri, Joe. "Romance of the Bat." Antiques and Collecting Hobbies, May 1992, p. 26. Pesky, Greg. "Expanded Coverage." Sporting News, June 1993, p.32. "Lanxide Shows Mettle with New Material." Sporting Goods Business, July 1993, p. 36. I am getting ready to cut down and ash tree in Fallbrook California and was wondering if is good enough quality for baseball bats? In turning the same identical model bats, I pick out 2 billets of the same weight, turn them, and come up with different finished weights. Any idea why and how to get the weights to be closer to identical? I turn both maple and birch wood bats. Thanks!